Comparing Neato Botvac Connected vs. iRobot Roomba 980: What Are The Main Differences? You may have heard that iRobot and Neato both offer Wi-Fi supporting vacuuming robots that can be controlled from your smartphone or tablet. iRobot's Roomba 980 and Neato's Botvac Connected are two of their most popular robots in the category of Wi-Fi supporting vacuuming robots. ​Major independent reviewers as well as most Amazon customers who bought and used these robots all agree that these two are two of the best Wi-Fi supporting vacuuming robots you can get today. Indeed, at the time this article was written, the average rating given by Amazon customers to these robots were 4.5 for the Roomba and 4 stars for the Neato (out of 5 stars). If you were planning to get a Wi-Fi supporting vacuuming robot and you are undecided regarding which of the two to get, this article will provide you with the main differences so you can make the right decision and choose the robot that will respond best to your home's vacuuming needs. This article will compare the iRobot Roomba 980 and Neato Botvac Connected Robots. iRobot Roomba 980 and Neato Botvac Connected Robots on Amazon. 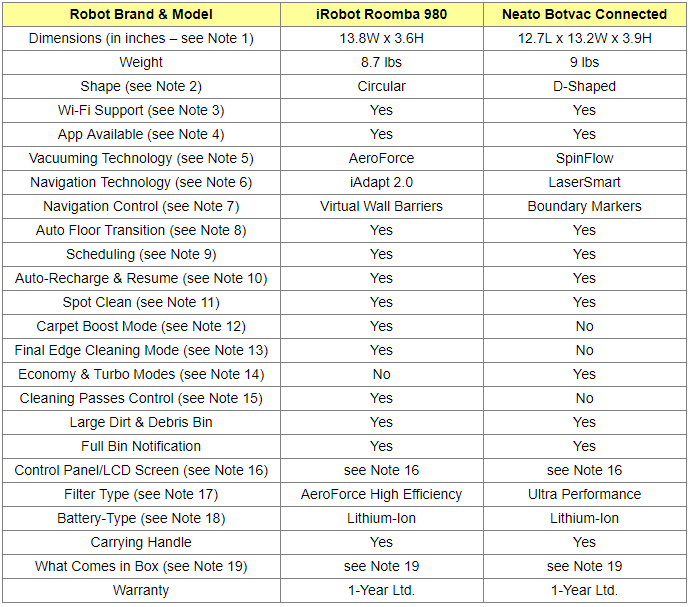 The following table compares the feature of iRobot Roomba 980 and Neato Botvac Connected. Please read the table notes that follow for a better understanding of the feature differences. Roomba 980 is a little bit thinner (only 3.6" in height as opposed to the 3.9" for the Neato Botvac Connected) which means that it can go better under low lying furniture. The Neato on the other hand, is a little bit narrower (13.2" wide as opposed to 13.8" for the Roomba) and therefore can pass better through narrower passages. Both robots are equipped with side brushes, but because Neato Botvac Connected has a semi-rectangular D-shape, it is reasonable to think that it can be even more efficient in cleaning better wall edges and corners. Note also that both robots are compatible with Amazon Alexa. Simply ask Alexa to start, stop, or dock your robot​. Both iRobot and Neato provide Android and IOS apps to control remotely the robots which can also send status and alert text messages to your smartphone or tablet. iRobot AeroForce technology used in Roomba 980 delivers the ideal balance of vacuum suction and debris extraction: The robot is equipped with counter-rotating dual multi-surface tangle-free brushes (known also as debris extractors) that grab and break down dirt and debris eliminating hair tangles and jams. A spinning side brush cleans along wall edges. In addition, an airflow accelerator creates a sealed channel that concentrates the airflow, sucking in all the debris. Thanks to the high efficiency vacuum created, the air power is increased 5 times in this robot compared to previous models of Roomba robots. Neato SpinFlow technology used in Botvac Connected combines powerful vacuum suction and precision brushes to leave floors immaculately clean. The robot can be equipped with three types of brushes: a spiral blade brush which combined with Neato's powerful vacuum suction removes easily debris, dirt and fibers, a combo brush which combines the cleaning power of blades and bristles and offers superior pickup of pet hair, and a side brush for thorough edge cleaning which allows the robot to get deep into corners and right up against walls as well as base boards for superior cleaning coverage. Roomba 980 iAdapt 2.0 technology uses a high-efficiency cleaning pattern and a full suite of sensors to map and adapt to real world clutter and furniture for thorough coverage. Roomba 980 is equipped with a camera that enables visual localization making possible seamless and efficient navigation of an entire level of your home. This is achieved with the use of Visual Simultaneous Localization and Mapping (VSLAM) technology which creates visual landmarks in its map so it doesn’t lose track of where it is or where it has been. Neato Botvac Connected is equipped with a laser eye that uses infrared light to scan the surroundings and uses the Simultaneous Localization and Mapping (SLAM) technology to build an accurate map of the room and any obstacles. Using this map, the robot is able to efficiently clean the floor in a pattern of straight and overlapping lines, avoiding obstacles and never missing a spot. To prevent the robot from entering off-limit areas, Roomba robots can be used with Virtual Walls which are tiny devices that emit an infra-red beam that the robot will not cross. Roomba 980 does not use any Virtual Walls, but uses Dual Mode Virtual Wall Barriers which, like Virtual Walls, can be used to block off an open doorway, but they can also be used as Virtual Wall Halos which protect some restricted area within the room. These units require 2 AA batteries. The 980 robot comes with 2 Dual Mode Virtual Wall Barriers, batteries included. The Neato Botvac Connected robot, on the other hand, uses Boundary Markers made of magnetic strips that are laid along the entry to off-limit areas. They are simple to use and best of all, they don't require batteries like Virtual Wall Bariers do. Both robots allow scheduling up to 7 times a week, one cleaning for every day of the week. But with the Roomba robot, scheduling must be done using the app, while with the Neato robot you can schedule using the app as well as the control panel on the robot itself. When the battery gets low, both robots return to the charging base to recharge. They then resume the vacuuming where it was interrupted. This allows seamless coverage of very large surfaces and entire floors without human intervention. Carpet Boosting is a feature that can be invoked from the Roomba 980 smartphone app and that causes the robot to automatically clean more intensely when rugs or carpets are detected. Both Robots are equipped witha side brush to clean wall edges. But using the Roomba 980 smartphone app, you can invoke special final edge cleaning action to make sure that stubborn dirt and debris along wall edges are all removed. .Eco is the power saving economy mode and gives you a quiet, longer cleaning. Turbo is the default mode and provides a super-powered cleaning, maximizing pickup of stuff like dirt, debris, and pet hair. Most vacuuming robots will remove dirt and debris with just one pass over each area of your home. With Roomba 980, two-pass cleaning can be requested and can be particularly helpful in homes with pets or for periodic deep cleaning. The number of cleaning passes is one by default. This feature can be invoked from the app. Neato Botvac Connected is equipped with a small LCD screen that displays status information (such as the scheduled time, battery level, cleaning mode, etc.) and has associated touchpad arrows that allow invocation of functions such as scheduling and vacuuming mode (note that you can also use the Neato app for invoking these functions). Besides the LCD screen, there are two buttons on the robot: the Power/Clean button and the Spot Clean button. There is no LCD screen on Roomba 980. You simply have 3 buttons: Clean, Home and Spot Mode. The Clean button is used to turn on the robot, to initiate a cleaning session, to pause and to stop the session. The Home button is used to send the robot to home base for docking and the Spot button is used to execute cleaning in a limited area (about 3 ft circle). All other functions, such as scheduling, selecting the carpet boost and edge cleaning modes, etc. are executed only via the iRobot Home app. The robot is also equipped with a number of status indicators (such as battery indicator, full bin indicator, etc.). Roomba 980 is equipped with an AeroForce High Efficiency filter that can capture 99% of allergens, pollen, and particles as small as 10 microns. The Ultra Performance filter found on the Neato Botvac Connected robot can capture particles as small as 0.3 microns. Both type of filters keep the air free of dust, pollen and other particles that can cause allergies. ​So which robot to buy: Neato Botvac Connected or iRobot Roomba 980? Ability to auto recharge when the battery gets low and resume the job where it was interrupted. VSLAM/SLAM technology that allows intelligent navigation as well as efficient and seamless vacuuming of an entire floor. Powerful filters (AeroForce High Efficiency and Ultra Performance) that clear the air from allergens. It is equipped with an LCD screen, and you can execute operations such as scheduling either from robot's control panel or using the Neato app. With Roomba 980 operations such as scheduling or selecting the carpet boost mode have to be invoked using the iRobot app. Dual Virtual Wall Barriers used with Roomba 980 to block access to off-limit areas require batteries, while the Boundary Markers used with Neato Botvac Connected do not require any. It offers the Economy and Turbo modes of vacuuming. It has a final edge cleaning mode that focuses more intensely on cleaning edges. It allows to control the number of cleaning passes during vacuuming.